I love this because I always have leftover bread and it never goes to waste with this recipe. The best part is that you can pull out as many pieces as you want and bake them straight from the freezer!" Mix butter, Parmesan cheese, parsley, and garlic powder in a bowl. 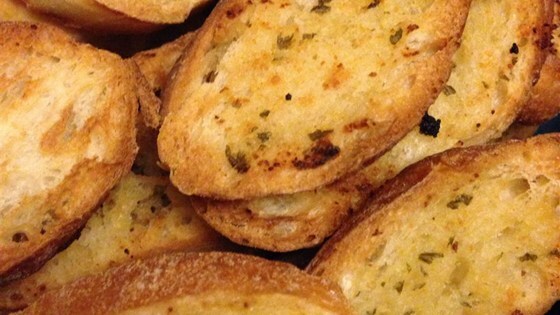 Arrange Italian bread on a large baking sheet and spread each slice with garlic butter mixture. Place baking sheet in freezer and freeze until bread solid, about 1 hour. Transfer bread to a resealable plastic freezer bag until ready to use. Preheat oven to 425 degrees F (220 degrees C). Arrange desired number of slices, butter-side up, on a baking sheet. Bake in preheated oven until bread is toasted and butter is melted, 5 to 7 minutes.